One way community psychologists work to empower marginalized groups is by including members as partners in the research process. Such participatory approaches can be difficult when working with vulnerable individuals who may be actively experiencing physical and mental health complications (e.g., psychosis), and often evaluators (myself included!) assume these individuals are incapable of meaningfully participating in research. In my experience, even the most vulnerable member can engage in the evaluation process! RAD RESOURCE: For info on participatory approaches, see the Community Toolbox’s chapters on CBPR research and participatory evaluation. HOT TIP: Intentionally build advocacy into the evaluation design. Once empowered, marginalized groups want to use their power to change the social conditions that contribute to their marginalization. In other words, empowerment leads to increased citizen participation and advocacy! At the conclusion of data analysis, HF participants chose to advocate for themselves using program evaluation data. RAD RESOURCE: Check out the Community Toolbox’s Advocating for Change Toolkit. 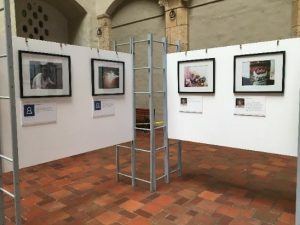 HF participants advocated for themselves through a Photovoice exhibit (above). HOT TIP: Practice self-reflexivity/critical awareness. When evaluating programs with marginalized groups, constantly examine your privilege and be aware of power dynamics and the historical context that impact your relationship with participants and their experiences. Given Hawai’i’s colonial history and the fact that a disproportionate amount of people experiencing homelessness are Native Hawaiian, my status as a member of the colonizer group necessarily impacted my relationships with program participants. RAD RESOURCE: Assess your privilege by calculating your privilege capital. Identify and purge your biases with the Bias Cleanse. HOT TIP: Be creative and flexible in choosing methods. Participants will have varying skills and capabilities, and you will need to creatively strategize ways to involve program participants in the evaluation process. The Photovoice method was useful for the HF participants because it allowed for both visual and verbal contributions to knowledge building. RAD RESOURCES: Need help brainstorming methods? See Action Catalogue – an interactive tool for choosing methods and Participatory Methods.org. The American Evaluation Association is celebrating Community Psychology TIG Week with our colleagues in the CP AEA Topical Interest Group. The contributions all this week to aea365 come from our CP TIG members. Do you have questions, concerns, kudos, or content to extend this aea365 contribution? Please add them in the comments section for this post on the aea365 webpage so that we may enrich our community of practice. Would you like to submit an aea365 Tip? Please send a note of interest to aea365@eval.org. aea365 is sponsored by the American Evaluation Association and provides a Tip-a-Day by and for evaluators.